Kuku Sabzi is a famous Iranian dish. It is a herbed omelette, made with fresh herbs, spinach and eggs and has high nutritional value. This thick and fluffy omelette forms a complete meal with Persian dill rice, grilled fish and salad. This is one of the traditional New Year dishes in Iran. Its believed that the herbs symbolize rebirth and the eggs, happiness. Herbs form an important part of the Persian cuisine. Saffron, cinnamon, nutmeg and other spices are frequently added to enhance the flavour of special dishes. This dish is traditionally prepared on stove top but can be baked too. The stove top method is usually preferred because it cooks relatively faster and is much more tastier. On stove top you have complete control over the dish, including temperature control and the omelette has to be flipped over and cooked after a certain period of time. The important point to be kept in mind is that only fresh herbs should be used for making the dish. It makes a world lot of difference to the overall taste. I was introduced to Kuku Sabzi through an Iranian friend of ours who is a gifted cook and a renowned baker. I love her dishes especially the desserts..they taste heavenly! Before marriage my husband used to have this dish whenever he went to visit the family and used to get occasional cravings. The first thing that he told her on seeing them for the first time after marriage was,"Teach her how to make Kuku Sabzi!" Spinach and herbs are chopped into small pieces, mixed with eggs and other spices and put into a pan greased with enough oil to prevent the omelette from sticking to the bottom of the pan and getting burnt. The pan should never be closed while cooking as the water oozing from spinach has to get evaporated and the dish has to become dry. The omelette is cooked on both sides until browned and well cooked. The omelette being thick cannot be flipped over as a whole and hence is cut into pieces before flipping over to the other side. Spinach is rich in iron,calcium and other vitamins and minerals. It is also rich in antioxidants.The combo of spinach along with fresh herbs and eggs rich in proteins makes a complete meal .This may be served as an appetizer or as a side dish. In a large mixing bowl add chopped spinach, cilantro, dill, basil, chives, parsley and spring onions. Mix well. Beat the eggs well and add to the above mixture. Add sage, salt, pepper, turmeric powder, Italian seasoning, nutmeg and mix well. Heat a wide mouthed pan at low-medium heat and grease with enough oil. Add the egg-herb mixture(if your pan is small add only half the mixture and cook in separate batches) and cook till the bottom surface is browned well and has become firm. Cut the omelette into halves with the spatula and flip each half to the other side. Before placing each half grease the pan with more oil. Cook until the bottom surface has turned brown and the whole omelette has become firm. Also a knife inserted into the center should come out clean. Remove from the pan, cut into pieces and serve hot. 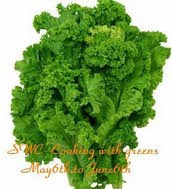 SWC-Cooking with Greens event hosted by Soumya and started by Lakshmi. Jhiva for Cilantro event by Cilantro. 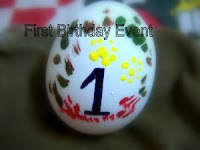 Event for Eggs hosted by Sudeshna of Here I Cook. Looks good...must try this. can you tell me how to make Dill rice? Kuku sabzi looks great and new Pooja...never heard of it...ur pics are tempting...wanna try it. Pooja, this is very interesting! I love Iranian food, but haven't tried much myself..
What a lovely dish.Its really high in nutritions.will try this recipe. Thanks Sailaja :) I'll be posting the recipe for dill rice very soon. Right Ramya, its healthy with spinach,eggs and herbs..hehe sure you may have it! Thanks Vineela :) Would love to hear how this turns out! Looks wonderful and yummy, Pooja. Lovely dish with nice color pooja..All those greens would have given a nice aroma..
Wow, that sounds interesting. would love to give a try. Thanks for sharing. Again a thumbs up to Iranian food!! This recipe is similar to frittatas.Really nice. There is a lot of greens going on in this dish, and makes it totally healthy. I will have to bookmark this.